The 2012 London Olympic Games coincided with my son’s last year of primary school. Each year the school has an “expo” in which students explore and create displays on some theme. In that year the school decided the theme would be the Olympics. One idea we (my son, wife and I) came up with was a model of an olympic torch with a “flickering flame” effect. This was just one of a number of items that had to be prepared by my son for the “expo”, and some parental assistance was expected, so we helped with that. My wife created the body of the torch from a cone-shaped industrial cotton reel and cardboard coffee cup, all spray-painted gold. I considered using a PIC micro-controller and a couple of discrete tri-colour high-intensity LEDs, but given the time and size constraints I decided to use a Freetronics LeoStick Arduino with two high-intensity LED units on a ProtoStick (from Jaycar in Adelaide) powered by a 9V battery. The LeoStick sits inside the coffee cup with cellophane over the top to provide a diffuser (added by my wife), as shown below. A momentary push-button switch is used to start the “flickering flame” for a short time as shown in this YouTube video. The serially clocked tri-colour high intensity LED units randomly and rapidly cycle through various colours to produce the effect. This Freetronics page describes the LED components and their usage in more detail. 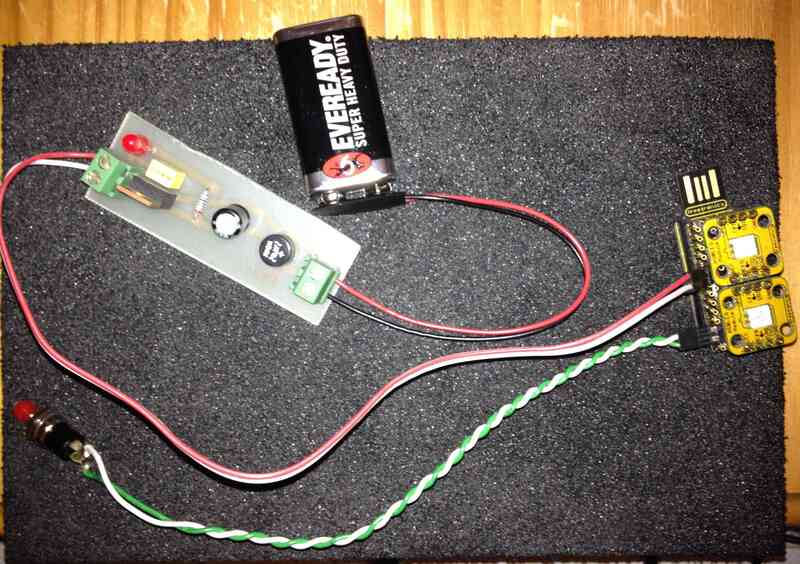 Note the large (by comparison to the LeoStick) home-brew 5V regulated power supply to which a 9V battery is connected. The power supply and battery sit inside the conical handle attached to a toggle switch (power on/off) in the base, a water bottle lid in this case. 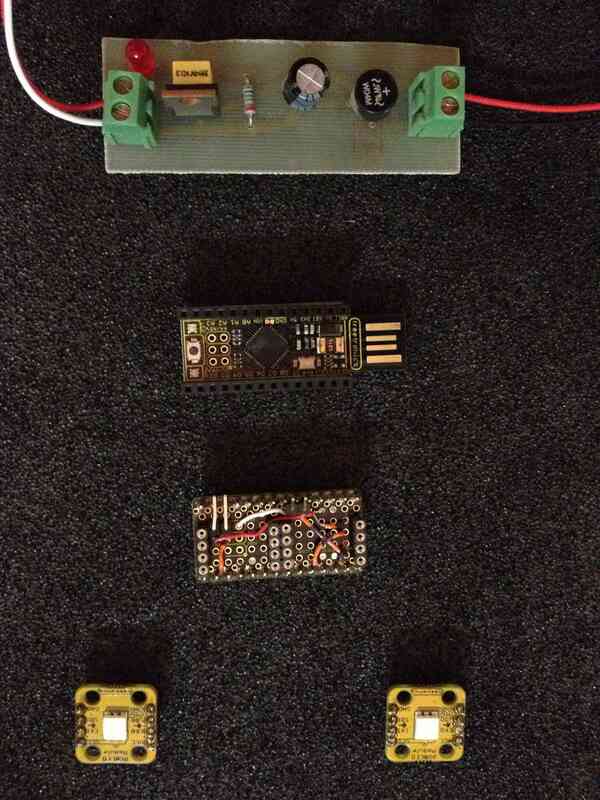 The high-intensity LED units are attached to the ProtoStick via headers soldered to the latter. The resistor in the schematic is a surface mount component soldered to the ProtoStick. The code for the project is shown below. As can be seen from the excluded code at the end of the loop() function, I toyed with adding a wake-from-sleep interrupt to conserve power while the circuit was active, but didn’t get that to function within the time available. There was no loss of functionality of course, just a greater drain on the battery because of the unfortunate busy-looping. * 2012 EMPS Expo Olympic Torch RGB LEDs, for Nicholas. // RGB LED strip pins (clock and serial data). // each for 15 seconds, then blank the LED strip. // A sleep mode with wake-from-interrupt would decrease power consumption. // Blank the RGB LED strip. // Generate random colors for random periods for specified number of seconds. // Set the colors on the RGB LED strip. // and wait for 500 microseconds for completion. 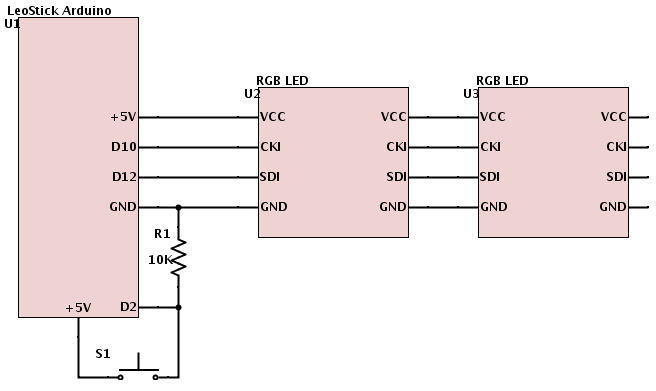 // Push a 24-bit RGB colour data (RRGGBB; red is MSB) out to the LED strip. // Low clock signals bit change start. // Force mask to be 32-bit instead of 16-but by default. // Write data bit and latch. // Returns whether the button was toggled (pressed then released). // Returns whether the button was pressed since the last time the function was called. // Read the state of the switch into a local variable. // long enough since the last press to ignore any noise. // ...reset the debouncing timer. // than the debounce delay, so take it to be the actual current state. // it'll be the lastButtonState. // Return a random color. // Proportions of each color component can be tweaked in the selection comparisons. 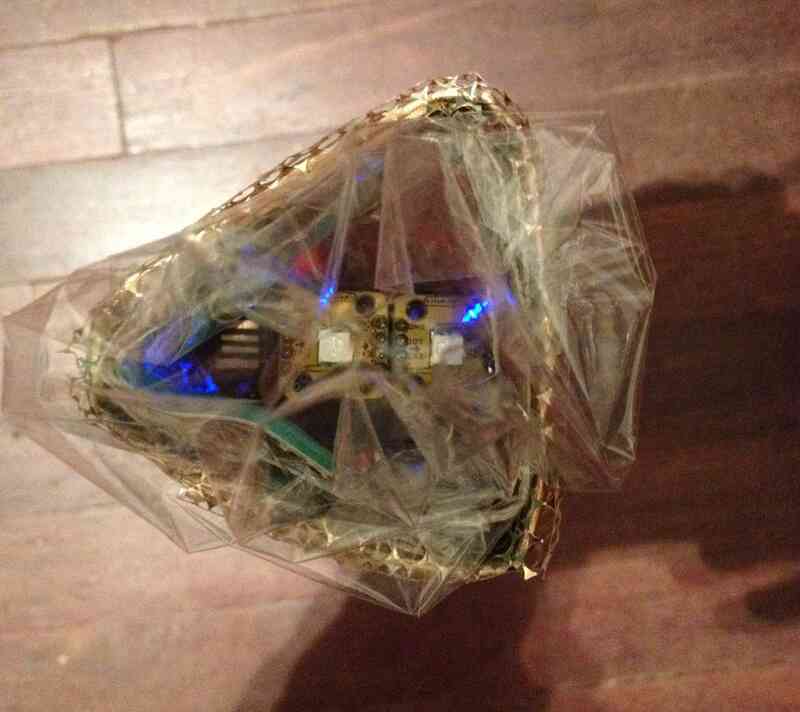 This entry was posted on February 5, 2014 at 7:47 am and is filed under Microcontrollers, Programming. You can follow any responses to this entry through the RSS 2.0 feed. You can leave a response, or trackback from your own site.